Finding the best credit card holder wallet for yourself is not an easy search at all. In this article, we show you outstanding credit card wallets so your search gets easier. In today’s increasingly cashless world, it’s hard not to see the appeal of a credit card wallet. With so many other ways to pay – Apple/Android pay, credit cards, debit cards, prepaid cash cards, and so on, it’s increasingly hard to justify the gigantic bifold and trifold wallets that were so popular in days past. You don’t need to keep all your receipts – you can look at your purchases online. You don’t have to carry all that cash – just use your debit card. That’s why credit card wallets are such a quickly growing category. They’re as simple as they are effective, often offering only paltry storage options for cash, while giving you plenty of card slots so you can easily and efficiently juggle your various card needs. While they’re not right for everyone, if you’re looking to cut down pocket bulk and simplify your life a bit, you may be interested in a credit card holder style wallet. Here’s a quick overview of the wallets we’ll cover below. Give it a quick look before you continue to get an idea of the sorts of products we’ll be working with. It’ll give you an idea of the sorts of different products available, and what they’re useful for. Personally, we are fans of card holder wallets because they’re convenient, small, and lightweight. With a limited number of card slots, you’re forced to actually think about the cards that you need to carry with you. Do you really need that Subway gift card with a $2 balance? How about that gym membership card that you forgot to renew 6 months ago? Card holder wallets force you to strip what you’re carrying down to the essentials, and that’s really a freeing feeling. Their small size and limited number of card slots also means that you’ll never have trouble finding your card – no longer will you have to sift through the dozen card slots and hidden pockets of a bifold or trifold wallet. You’ll always have exactly what you need, and it’ll always be exactly where you need it. That’s why we’re such big fans of these wallets. Don’t let all this talk about minimalism fool you. While you might have to cut down on what you carry a little bit, these wallets are far from impractical. Most come with at least four card slots, which allow multiple cards in each. There’s plenty of space for the cards you need, including debit, credit, ID, loyalty cards, health/auto insurance, etc. Don’t let all of this talk about minimalism scare you off, or make you think that you’ll only be able to carry 1-2 cards. That’s not the case. Simplifying doesn’t mean just cutting out necessities – it means cutting out everything that’s not a necessity. Here we’ll take an in-depth look at some of the different cardholder wallets that are top-rated in their categories. Despite the simplicity and economy of these stylish wallets, there is a surprising amount of versatility, so you’re sure to find the one that’s perfect for you, regardless of what you usually carry in your current wallet. Summary: The FRYE Men’s Logan Antique Pull-Up Card Holder is a great example of what to expect from minimalist card holder wallets. Crafted out of 100% imported leather, and coming in 4 unique colors, it’s a bit more expensive than some other offerings on the market, but it’s certainly manufactured with quality in mind. Heavy-duty stitching accents high-quality, durable leather, creating a luxurious wallet that’s stylish and high quality. The leather, while thick and well-made, can be a bit stiff when you’re first breaking in this wallet. Though over time it’ll become buttery-smooth and quite soft, initially you may have a bit of trouble adding and removing cards due to the stiffness. It’s well worth getting over this hurdle, however. This wallet features four dedicated card slots, two on each side. These pockets can hold 5 cards easily, or 6 with a little bit of pushing and prying. And though, unlike some other card wallets, it doesn’t come with a dedicated cash slot. However, one of the lower card slots can easily be used to hold some cash if you fold it up into quarters, allowing you to keep a low-profile wallet while still carrying a bit of cash for those rare scenarios where you encounter a place that won’t take cards, or is having technical difficulties with their equipment. 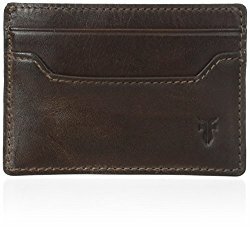 Overall, this is quite a good wallet for the price, but given its lack of a cash slot, you’ll be limited to 3-4 cards if you’re looking to carry some cash in this wallet, so unless you’re a real minimalist, you may find it a bit hard to carry everything you need with you. For this reason, we give it a 4 out of 5. Summary: If you’re looking for a really minimalist wallet that still has an actual cash slot, this Jack Spade Men’s Grant Leather Credit Card Holder is perfect for you. While it only has two card slots, these can be expanded to hold two cards each, giving it a max capacity of four cards (or five, if you place a card in the cash slot rather than some folded-up bills). The leather used in this card holder is very high quality, and the tonal stitching really blends into the colored leather, giving it a seamless, matte finish that’s really quite attractive to handle and to look at. You’ll certainly get style points with this minimalist wallet. In addition, the card slots and cash slots have a great pebbled texture that helps you easily slip your cards and cash in and out. This is great, because when you fully load this wallet with 4 cards and some cash, things get a little bit tight. But due to the design and texture of the leather, you’ll never have to deal with stuck cards or cash. Obviously, this wallet is not perfect for everyone, but if you’re looking to challenge yourself to a minimalist wallet that still has room for a cash stash, at a very good price, it would be hard to beat this card holder by Jack Spade. Just make sure you’re up for the challenge. Given all the above, we would give this wallet a rating of 5 out of 5 for its intended minimalist audience, though it’s not suited for anyone who wants a slightly more versatile cardholder. Summary: Whether you need an ID slot because you have CDL, must display identification to get into work, or just like being able to go into a bar without removing your ID every time, it’s certainly a useful feature, and it’s much more common in bifold and trifold wallets than it is in cardholders. Well, the Fossil Men’s Elgin ID Card Case FPW gives you all the functionality and convenience of an ID slot in a small package with a surprising amount of storage. The ID slot takes up one side of this color-blocked, combination textile/leather wallet. Unlike some other ID slots, it does not have a plastic covering, which does give your ID a little less protection, but makes it easier to take out of the slot if necessary. Above the ID slot, there’s a card slot that can hold up to two cards. On the opposite side of the wallet, there are two other card slots, both of which can accommodate about two cards apiece, bringing the total card slot storage of this wallet to 6. The center of this wallet also opens into a quite sizeable cash slot, easily able to hold several bills either folded in half or quarters. The combination leather/textile design is flexible, durable, and attractive, with enough give that it’ll be easy to use, even when filled to max capacity. Our only real concern with this wallet is that a small number users report that, after extensive use, the stitching on the ID slot may begin to fail, and that the ID slot can obscure information on the edges of certain ID cards. These are certainly not deal breakers, and these problems only occur in a small amount of users, but they’re good to be aware of as you make your purchasing decisions. 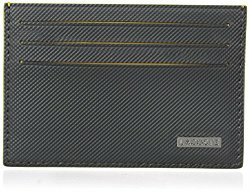 Beside that, this wallet offers a great ID slot, tons of storage options, and a durable and attractive design at a low price. 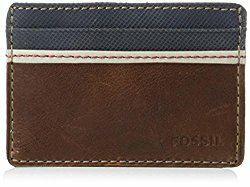 If you’re unconcerned about removing your ID a lot, and in the market for a fully-featured credit card wallet, this wallet by FOSSIL is certainly worth a look. Summary: This ROCO Minimalist Aluminum Slim Wallet Money Clip – No.2 is wholly unique. 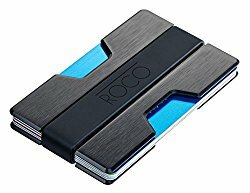 ROCO has created a combination money clip and credit card holder, and solved the major problems with both products by utilizing a totally unique design. The main issue that cardholder wallet users report is the “too much change” problem. That is, while card holders can hold a couple folded $20 bills, once you break one of those bills, you’re often left with too many bills to stash in a minimalist wallet. In the same vein, users of money clips will tell you that while it can be nice not having to carry a wallet, and they can carry tons of cash with no problems, they sometimes wish they could better organize and protect their credit cards, and carry more of them without their money clip holding on too tightly, and risking damage to the cards. So ROCO decided to combine both of these products into a singular, wholly unique design. Basically, this combination wallet/money clip consists of two pieces of high-quality aluminum, held together by a silicone “money clip” strap. Cards are accessed through the side of the device, and cash is stashed under the silicone strap, which provides a secure hold without tearing. This wallet is totally expandable, too. It comes with two different-sized silicone straps, a small one suitable for 4-5 cards with some cash, and another larger one that can expand to hold over 15 cards and a large amount of cash. When using the smaller band, this is a totally great minimalist wallet, and if you want to carry more cards and cash, you can swap to the large band. However, keeping 15 cards organized without separate storage pockets can sometimes be tricky. You may find yourself searching for a specific card more often than you would like. Overall, we’re huge fans of this totally unique card holder/wallet. However, its greatest feature is its greatest weakness – it’s unique, nontraditional, and has a bit of a learning curve. If this wallet sounds like it’s right for you, we totally recommend taking it out for a spin. However, if you’ve never used a money clip or a minimal wallet before, you may want to look for a more traditional offering. Overall, it’s up to personal taste, and if you think this wallet is right for you, you’re probably going to love it just as much as we do. 6 storage slots and cash slot. Summary: The Lacoste Men’s Edward Credit Card Holder is a sleek and beautiful minimalist wallet that still manages to pack quite a few features and lots of storage space into an attractive, well-made package. The colors of this wallet are beautiful and rich, and the unique interior-sliding card holder slots integrate very smoothly with the rugged, durable, yet sleek leather used to create it. The wallet features six card slots total – three on each side, and a large cash slot in the middle, allowing for plenty of storage, and lots of organization, as you will rarely need to put more than one card in each slot. The high-quality pique leather is pliable and supple, allowing easy storage and withdrawal of both cards and cash. We really like this wallet a lot, and if you’re looking for a simple wallet and are willing to spare no expense, it’s probably the perfect cardholder wallet for you. The only real concern we have is with the Lacoste branded metal plate. We know not everybody likes conspicuous branding, so that may be a bit of a turnoff. But that’s hardly enough of a concern to take not of, and if you like the design and simplicity of this wallet, its quality and durability are sure to serve you very well for a long, long time. Summary: This TUMI Chambers Slim Card Case is a fully-featured, luxury wallet that incorporates several wonderful features inside its 100% genuine leather, textile-lined design. It has three card pockets that can easily hold two cards each, as well as a large cash slot and and ID slot, all in a tiny, slim and minimalistic package. 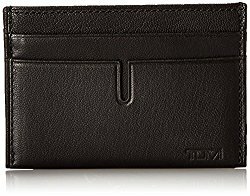 The quality leather is durable and well-stitched, and unlike some other offerings in lower prices ranges, this TUMI wallet is lined with a synthetic material that helps you add and remove cards and cash easily and efficiently. The ID window is made with a textile mesh that protects your ID while still offering good protection, and the entire wallet incorporates TUMI ID-Lock technology, which blocks RFID signals from accessing information from smart cards in your wallet. We have no complaints about this wallet. Its high quality, incorporates plenty of storage both for cards and cash, and an ID slot, as well as top-of-the-line security features. It’s not cheap, but it’s certainly worth the price of entry if you need a beautiful, feature-rich wallet that’s still minimal enough to hold only the essentials. We understand that the options we presented above are not suitable for every man out there. 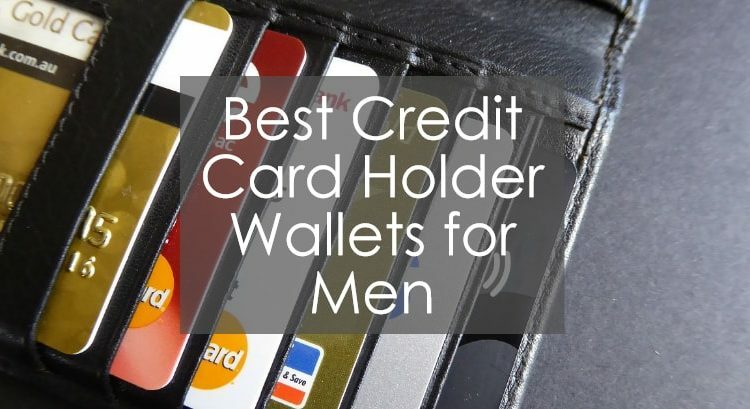 If you are looking for a men’s wallet that holds a lot of credit cards then you should consider a Secrid Twinwallet. It offers space for 12 – 16 cards and some notes. We think this could fully meet your needs. Despite their small form factor and minimalist qualities, there are tons of different card holders and credit card wallets out there. This is just a sampling, but should give you a great idea of what options are out there for you. And if all this minimalistic talk is too much for you, don’t worry. There are plenty of great bifold wallets out there that maintain a small profile while still having the classic features and designs that they’ve been made famous for. And if you’re not looking for a bifold, but not quite looking for a credit card holder, check out our reviews of smaller traditional wallets (slim wallets), that often combine the best of both worlds with a smaller, lightweight design that’s a bit more modern.